Our newly developed FIGAERO (Filter Inlet for Gases and Aerosols, Lopez-Hilfiker et al.) 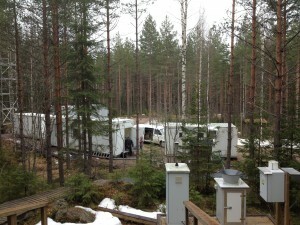 had its first field deployment with the HRToF-CIMS in the boreal forest in Hyytiälä, Finland, during April/May 2013. 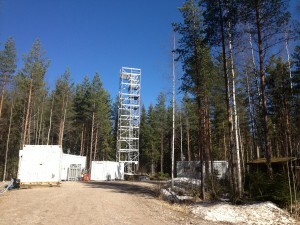 A remote site in a Scots Pine forest, the Hyytiälä forest station sees frequent new particle formation (NPF) events related to atmospheric oxidation of biogenic emissions such as α-pinene. The ability of the FIGAERO-HRToF-CIMS to measure chemical compounds in both the gas and the particle phases allows us to investigate these new particle formation processes. 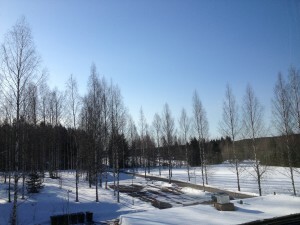 During the 4-week long deployment of the FIGAERO-HRToF-CIMS we observed more than 10 NPF events, witnessed the transition from winter to spring and with that the onset of increased biogenic emissions due to foliage growth, and measured emissions from a nearby sawmill.